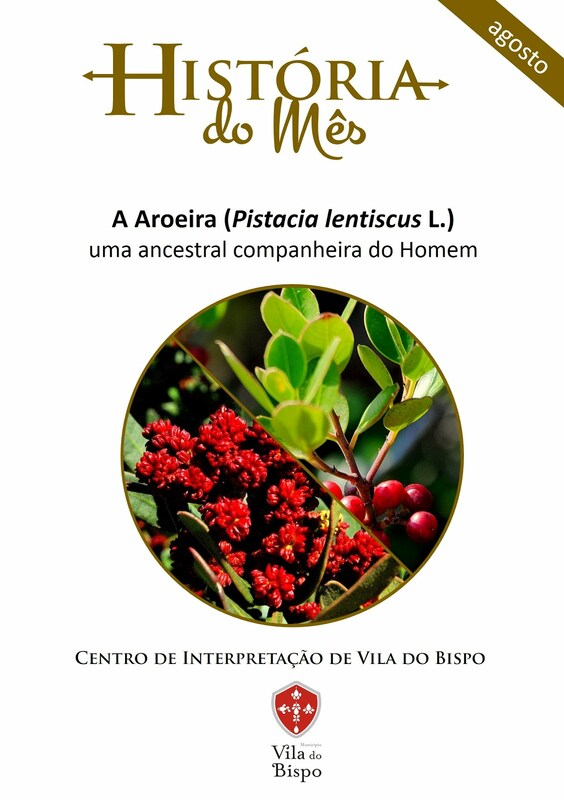 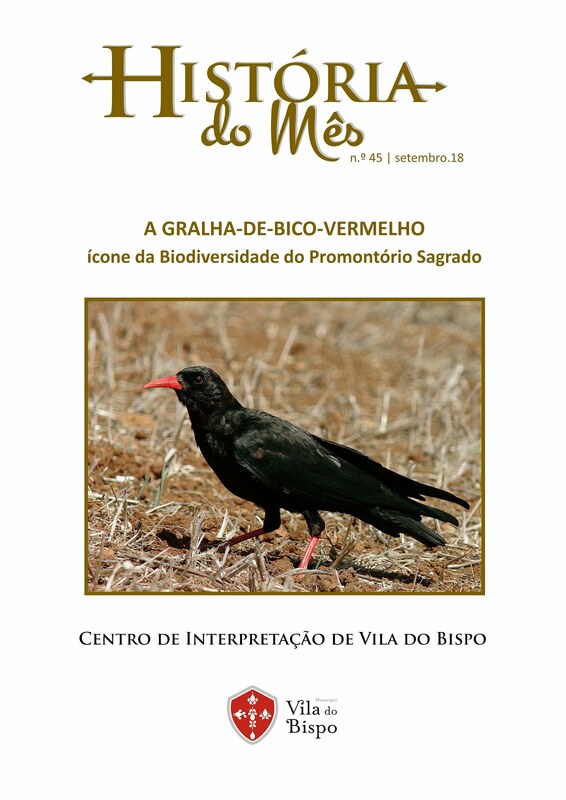 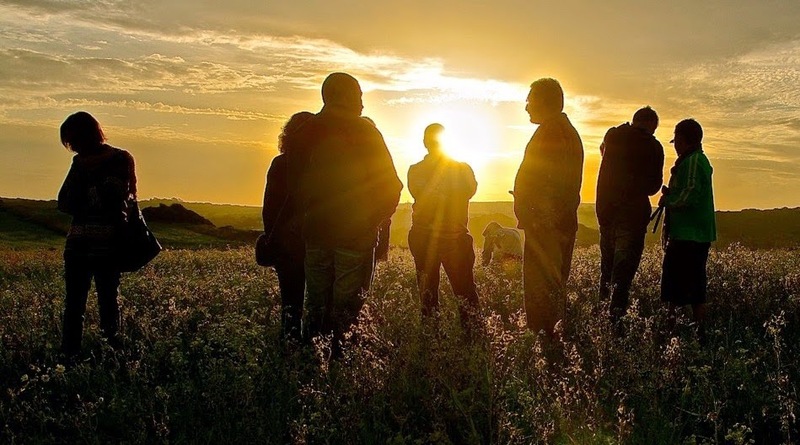 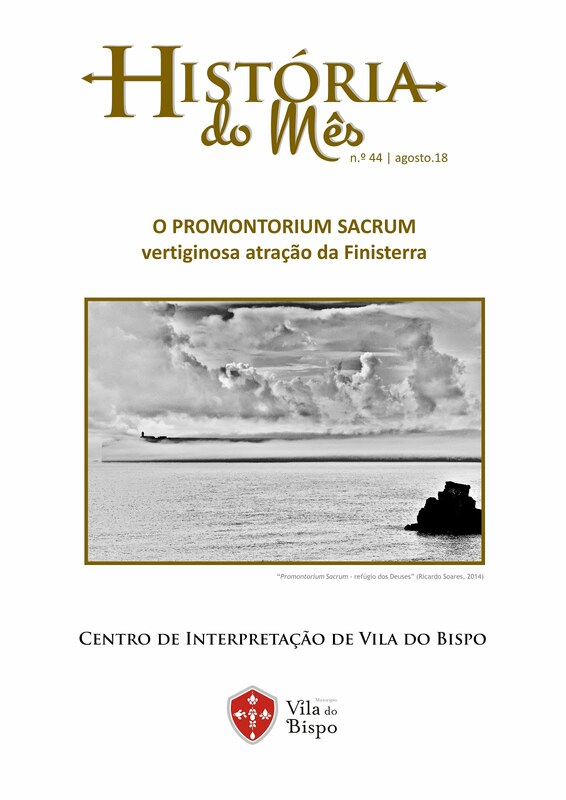 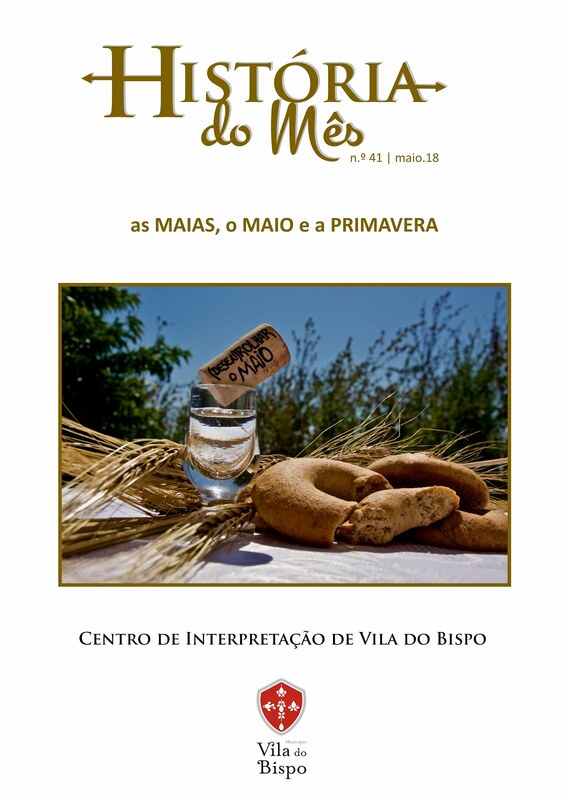 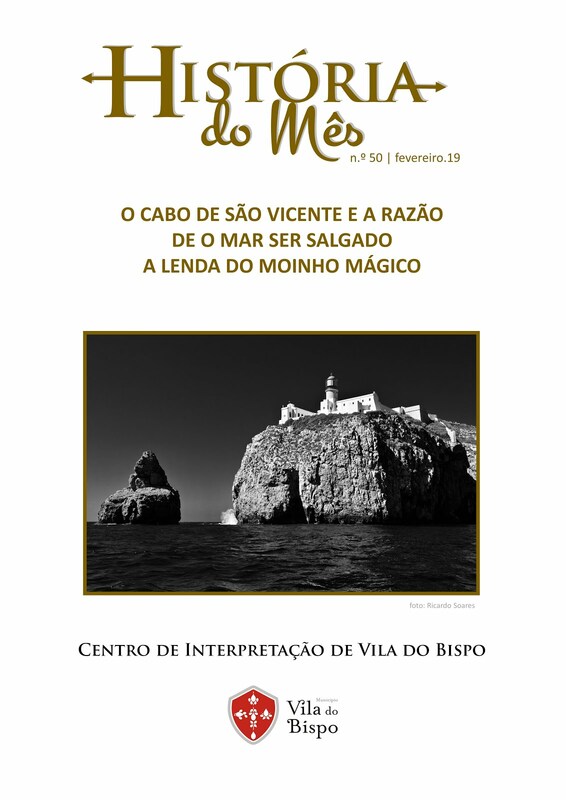 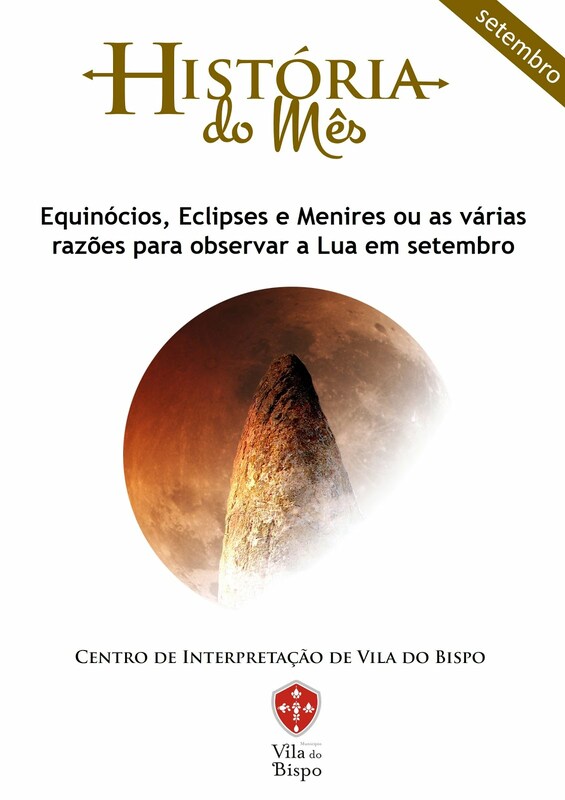 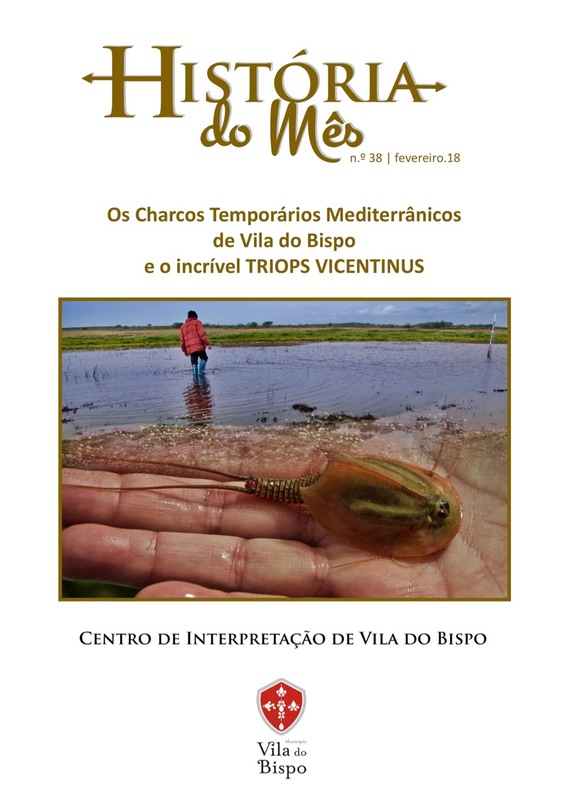 Na sua 7.ª edição, entre o dia 30 de setembro e o dia 5 de outubro de 2016, poderá usufruir de um extenso e diversificado programa, recheado de atividades dedicadas ao património natural e cultural do Concelho de Vila do Bispo. 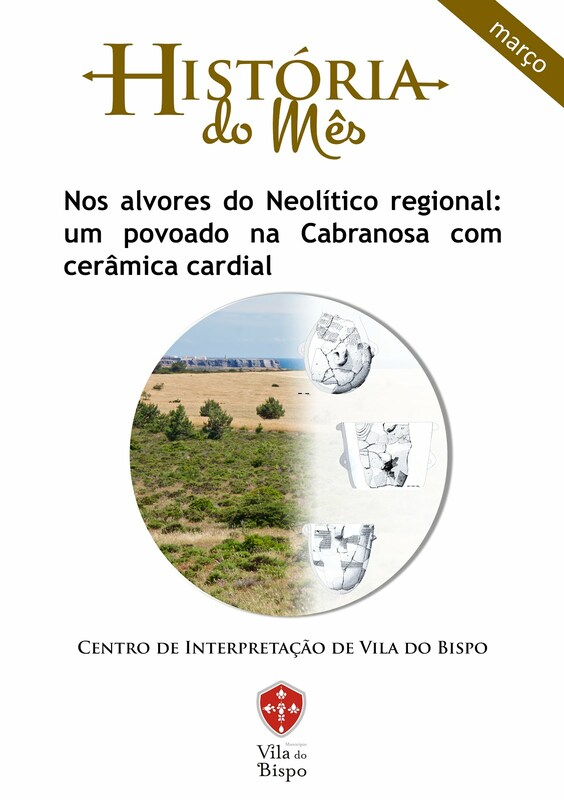 The necropolis was known to exist due to the earlier (2003) recovery of human remains. 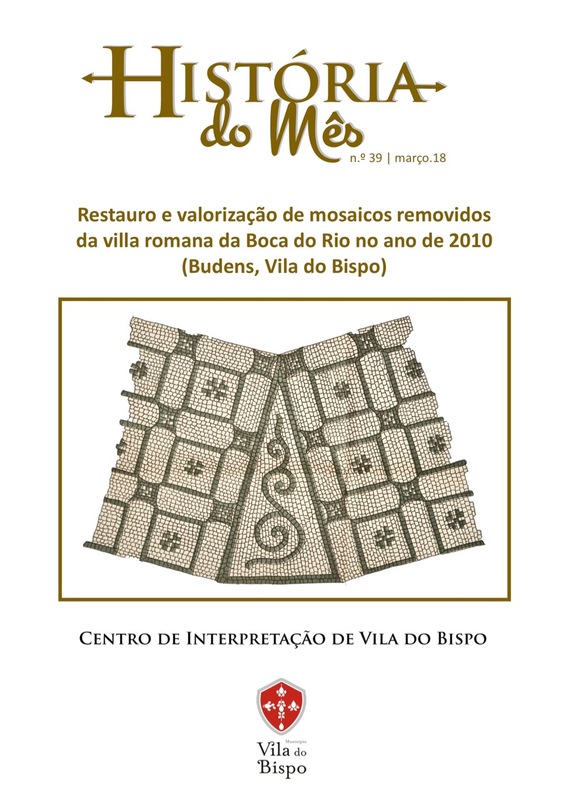 It is thought that the necropolis is quite extensive and is obviously connected to the Roman site at the Boca do Rio below. 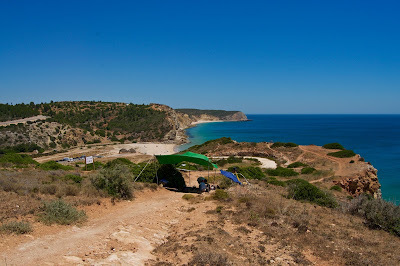 The site is on a slope and close to the cliff edge. 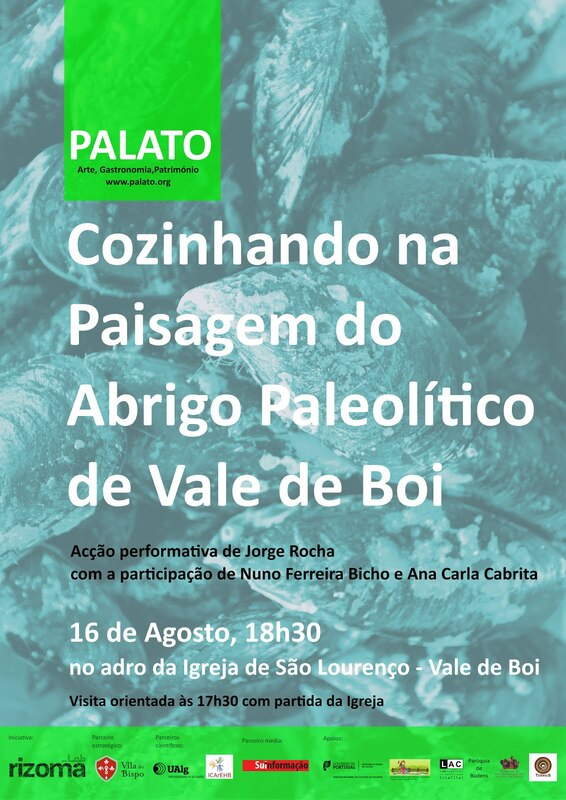 Remains of the necropolis were becoming exposed because of rock falls and cliff erosion and are under further threat from rain water erosion and foot traffic on the cliff top nature trail that runs from the beach at Boca do Rio to Salema. 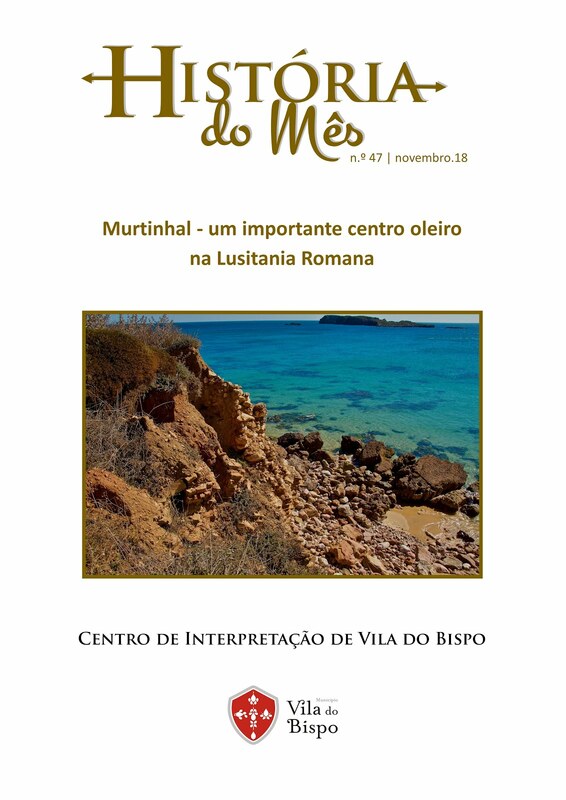 In fact there is one grave exposed in the cliff face. The work this year was primarily to investigate and recover remains before more cliff erosion occurs. 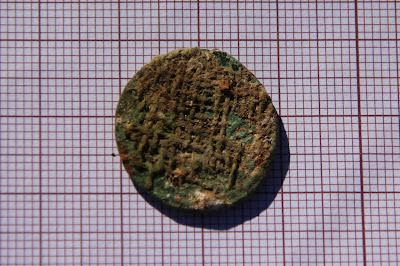 Unfortunately there has also been illegal metal detecting in the area and this makes the excavations even more imperative as continuing policing of the site is difficult. 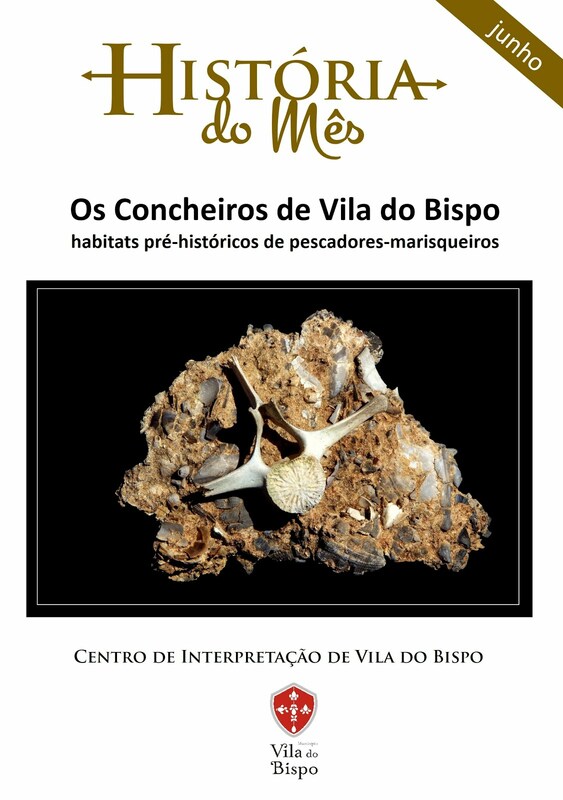 It is also thought that some ‘grave robbing’ may have occurred in the 18/19th century when new buildings were constructed over the Roman site by the beach for the fishing industry under the instructions of the Marquis de Pombal. 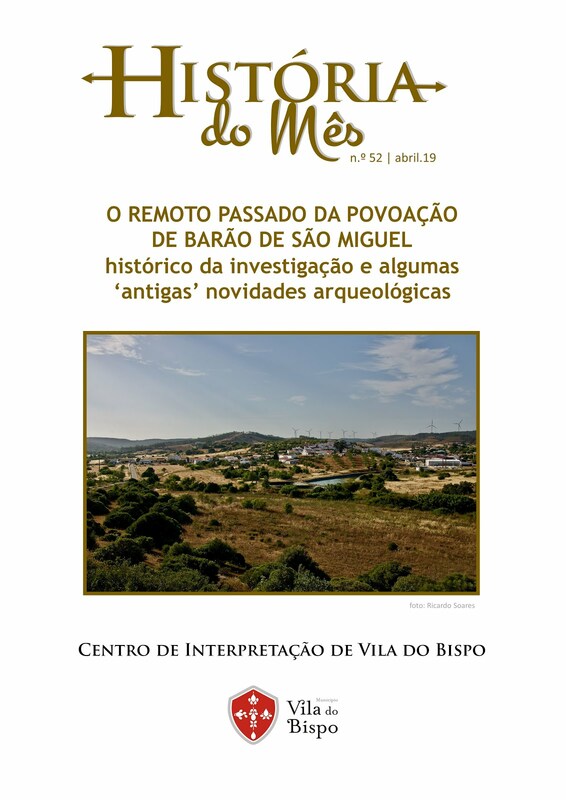 The excavations took place in July 2016 with a team of 7 coming from the universities of the Algarve, Évora and Coimbra, directed by João Pedro Bernardes and with collaboration of the archaeologist of the municipality of Vila do Bispo, Ricardo Soares. 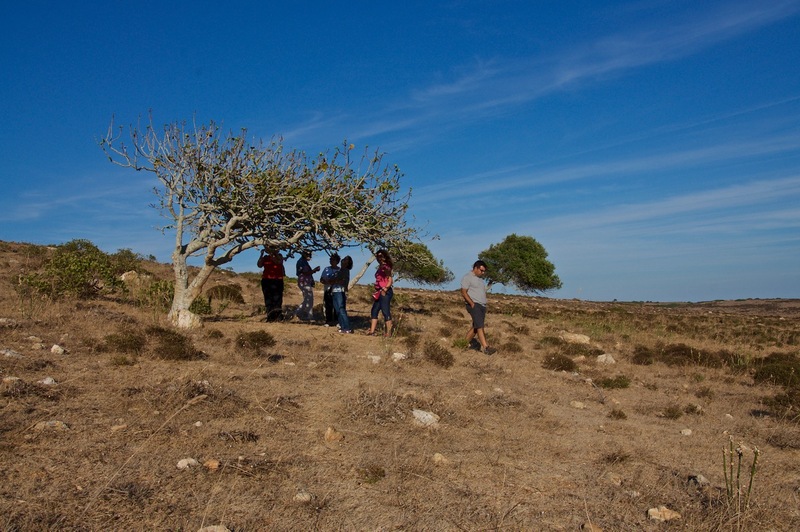 At locations, which on the surface showed indications of grave presence 5 surveys were made. 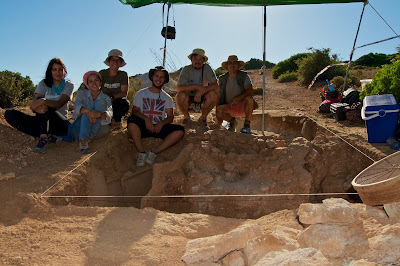 In these we uncovered 9 graves; one of cremation – being the oldest one – and the other 8 of burials. 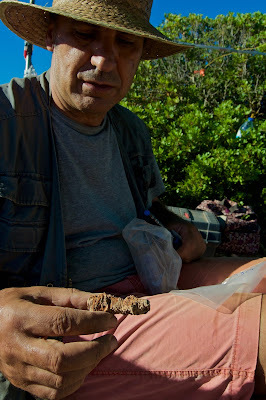 As the limestone destroyed most of the skeletons we only found bony remains in 3 of the graves. 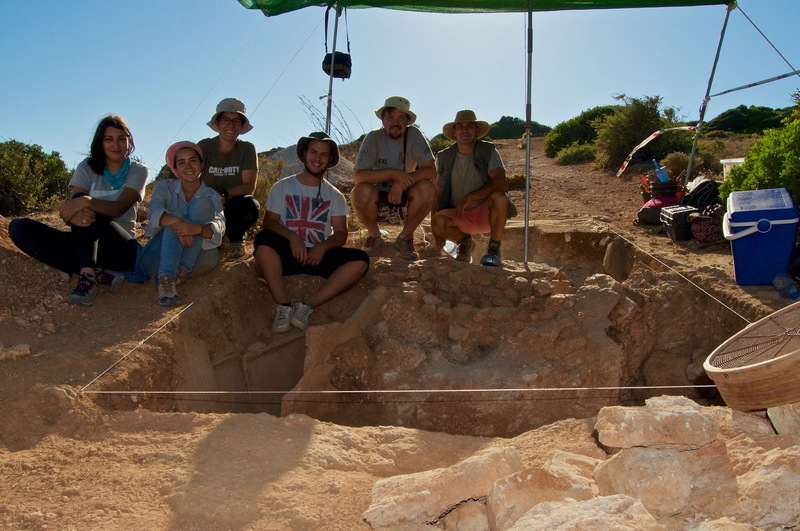 In one of the graves, where the soil contained less lime, a practically complete skeleton was found (header picture). By the type of grave and associated materials found, the graves can be dated as being from the second half of the 3rd century until the end of the 4th century or early 5th century. 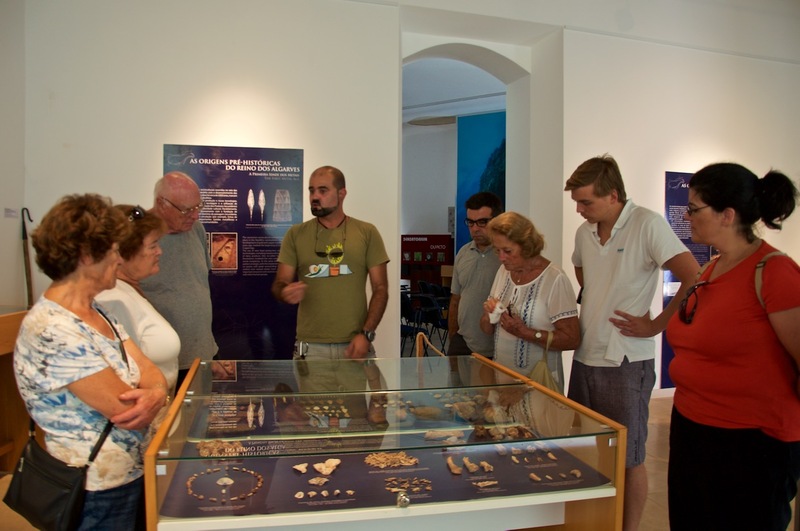 The oldest grave (cremation) belonged to a child - based on a milk tooth recovered - and was dated to belong to the second half of the 3rd century. 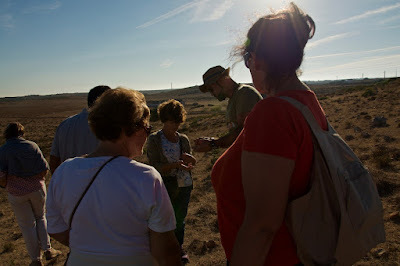 In this grave we also found other materials: a coin, a lamp, a small vase and a bowl of terra sigillata imported from Tunisia. Around this grave several burial graves were found that had been dug into the rock and constructed with tiles (tegulae). 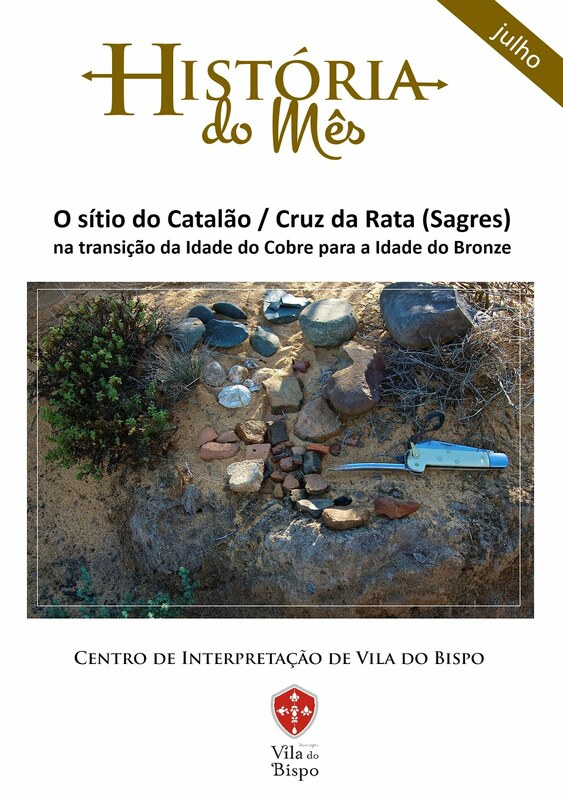 A grave – also of a child – in a box made of stones was constructed over the ashes of the first grave. 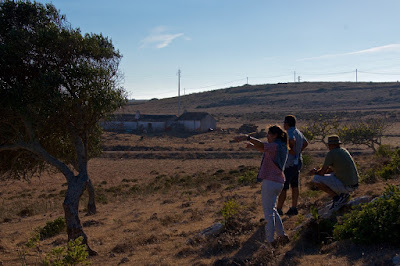 This is the area (area I) where 4 of the above mentioned burial graves have been uncovered with the almost complete skeleton of a woman of 30 - 40 years of age as well as the bony remains identified of another. 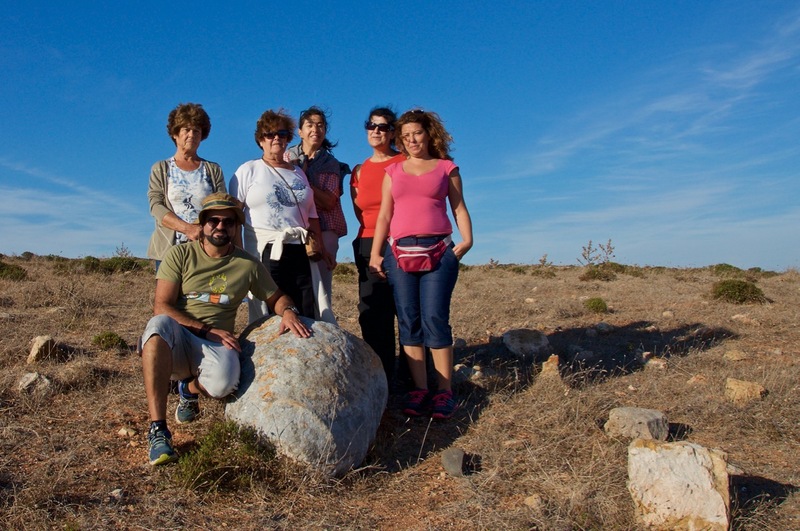 The other 4 graves that were dug into the rock were found in other areas. 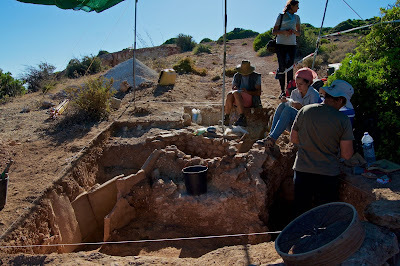 In the 2 graves found in area III no bony remains were identified but only fragments of tegulae, which had outlined the burial space. In one of them, the pit that outlined the area where the body had been deposited could well be identified. 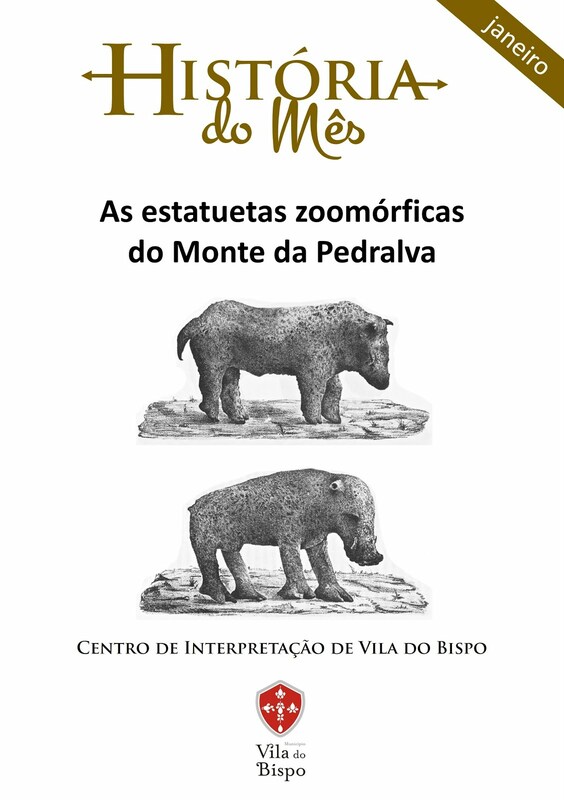 In the other it was only possible to identify displaced tegulae indicating the presence of a grave, but which has not been excavated further. 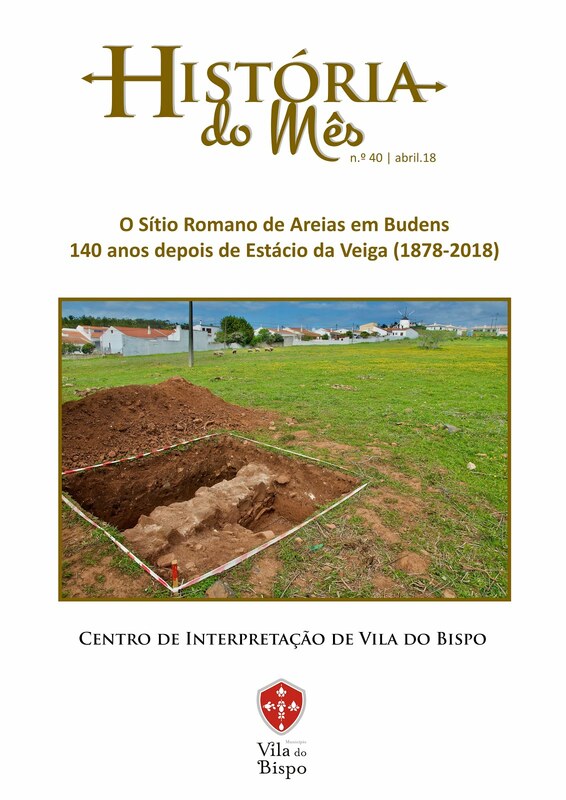 In area II two more graves were found. The first grave was excavated in the rock and contained a few long bones and part of the skull, both in very bad condition. From behind the skull we recovered a coin with traces of fabric attached which must have belonged to the shroud that enveloped the body. 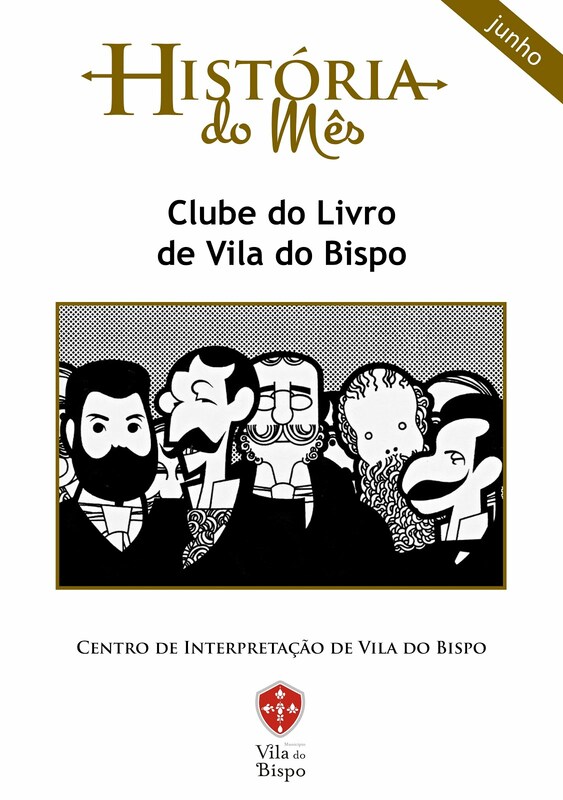 The other grave is richer. 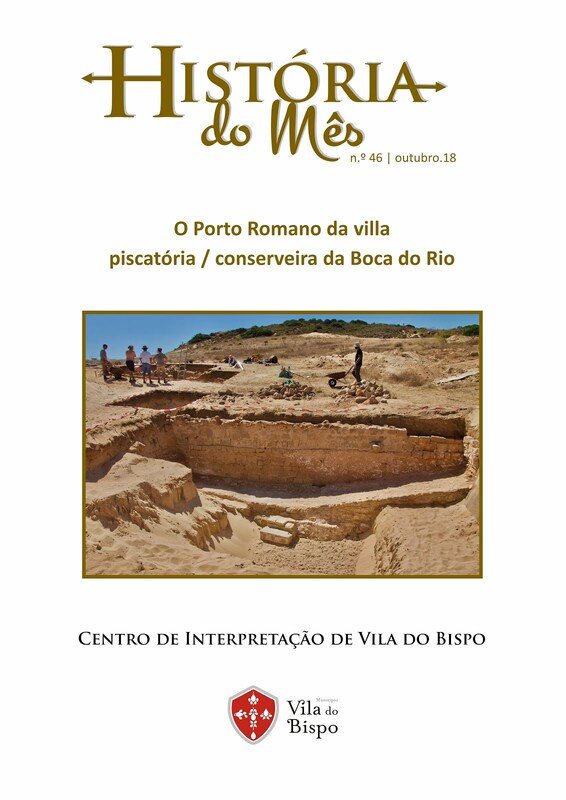 A box of 7 x 3.5 Roman feet (2.1 x 1.5 m) had been excavated in the rocks and afterwards covered with a layer of opus signinum (cement), which had already been partly destroyed ('grave robbers'?). 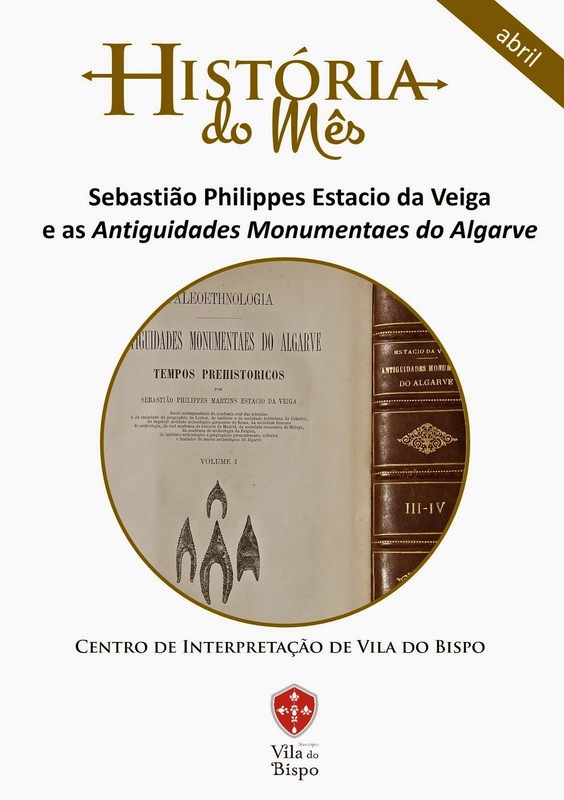 This grave is already reminiscent of the Christian sarcophagi, which are found frequently from the 4th century onward. 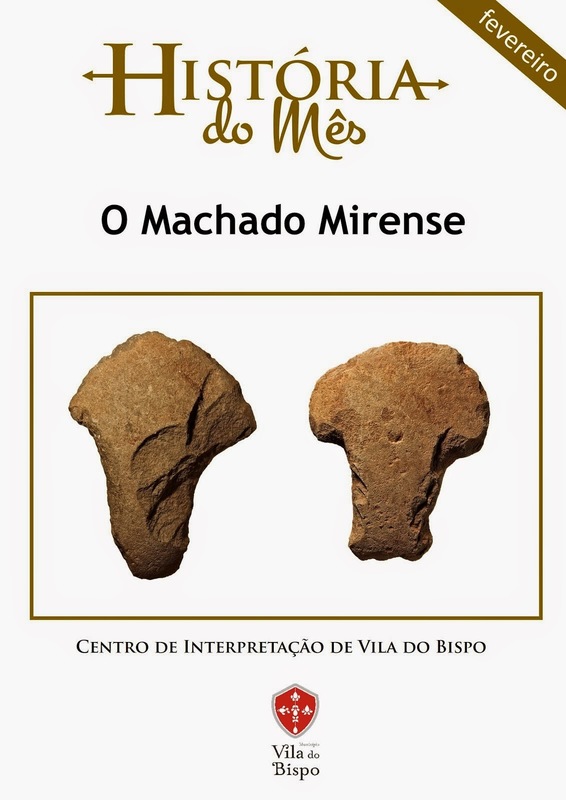 Here we only found the skull of the interred individual who had been buried in a wooden coffin from which it was possible to collect nails and fragments of wood. 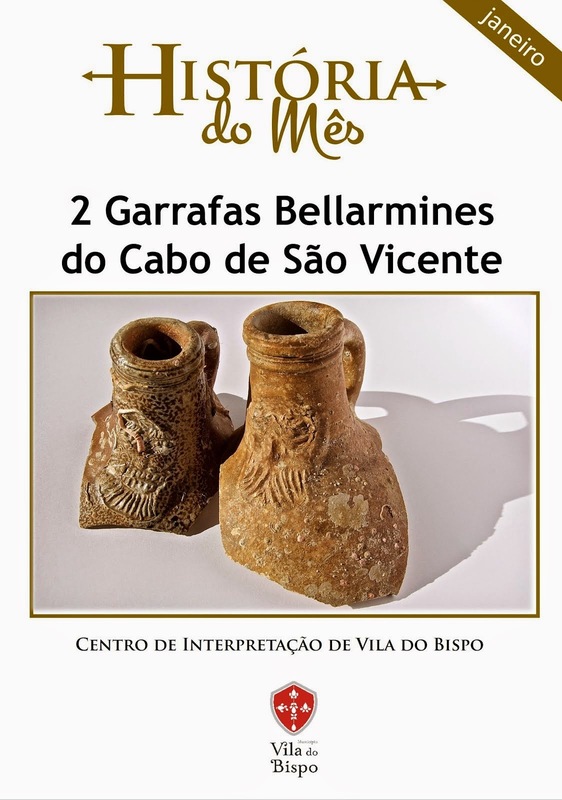 At his feet was an almost complete glass bottle. 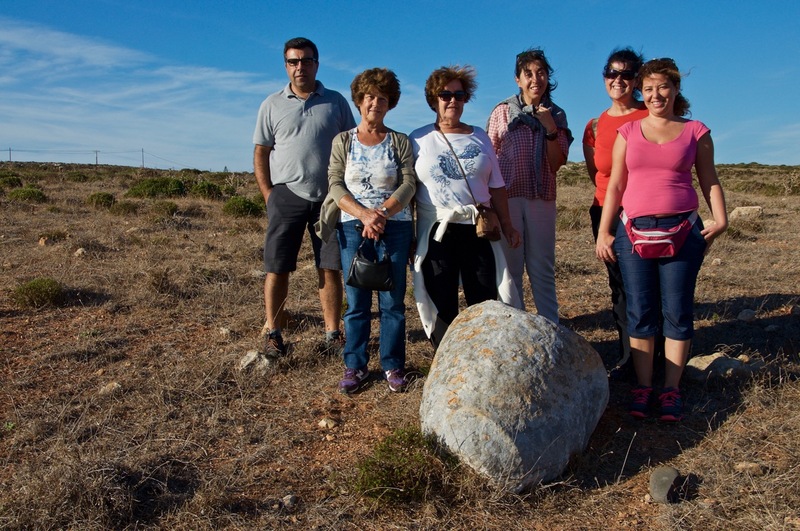 This grave, with a NE-SW direction, called for more investigation into its construction. 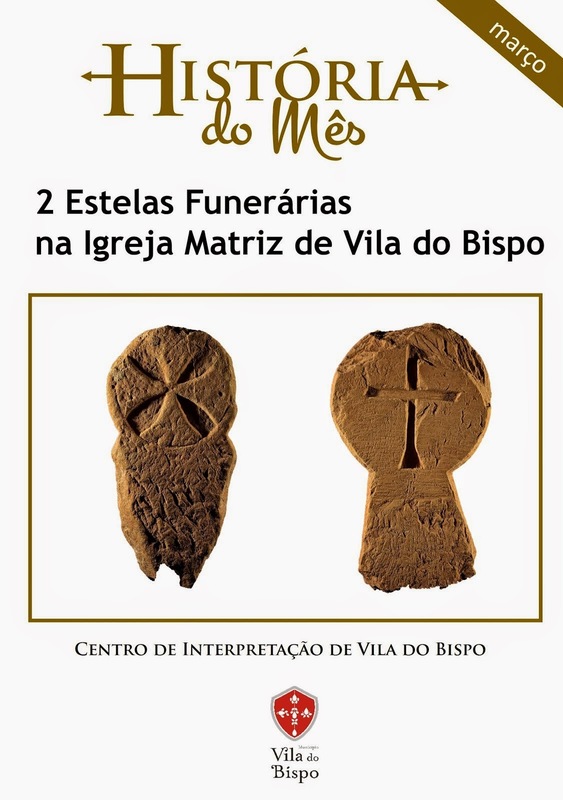 The excavated graves are in a transition period from cremation to a total and definitive burial, typical of the Christian period. 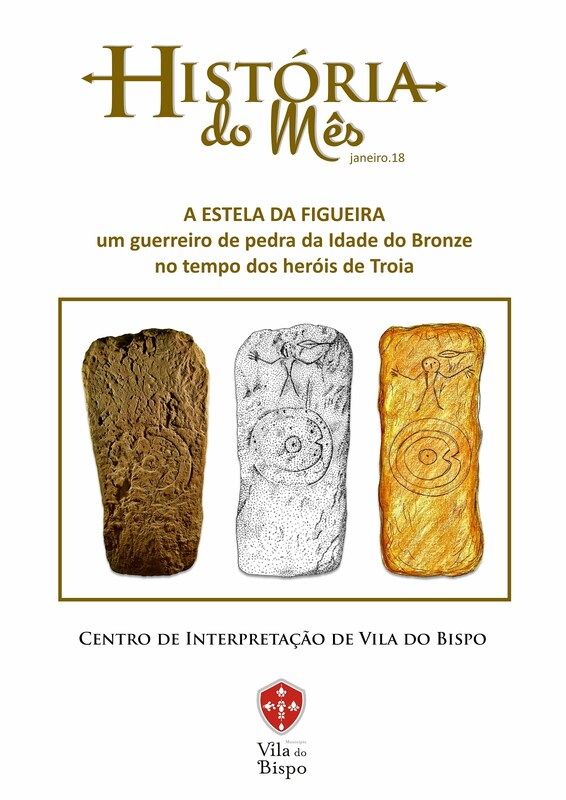 But where are the graves of centuries I and II, relating to occupation of the site of Boca do Rio at this time? 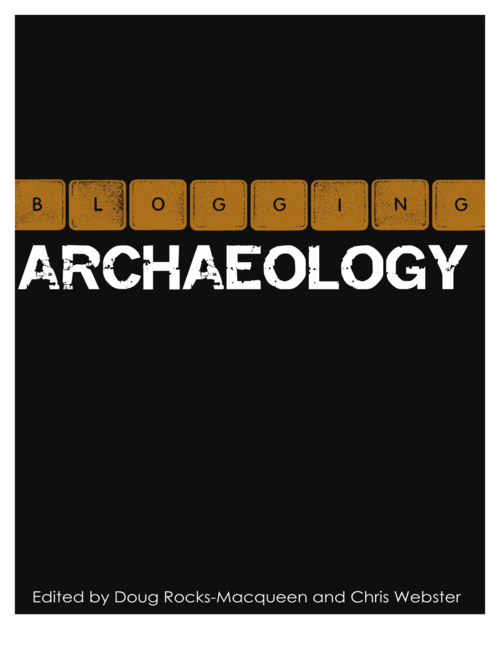 Perhaps close to this site?! 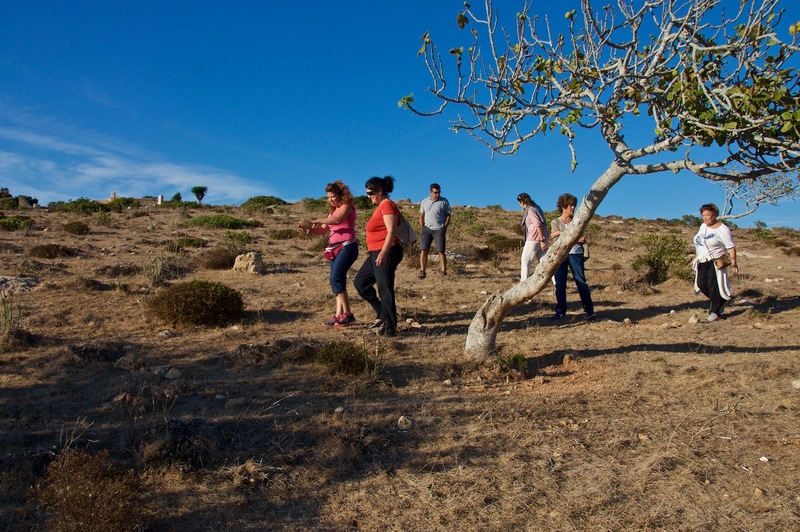 All the graves were recorded by geo-reference and by aerial photography using a drone. 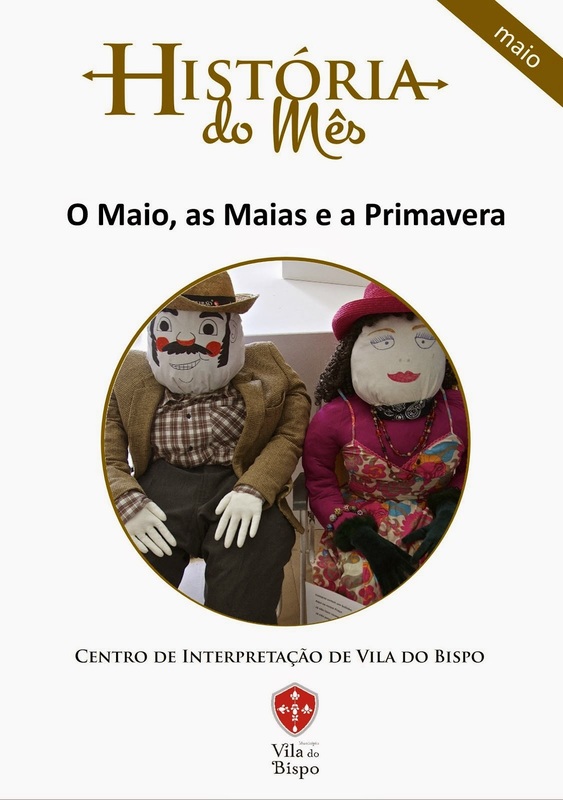 No âmbito das Jornadas Europeias do Património, em 2016 dedicadas ao tema “Comunidades e Culturas”, a Câmara Municipal de Vila do Bispo organizou um programa que se desenrolou ao longo da tarde do passado sábado, dia 24 de setembro. 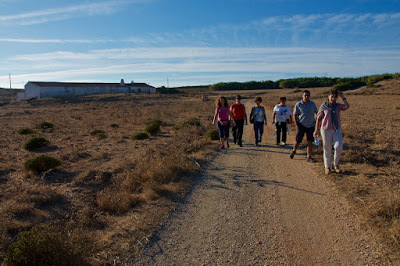 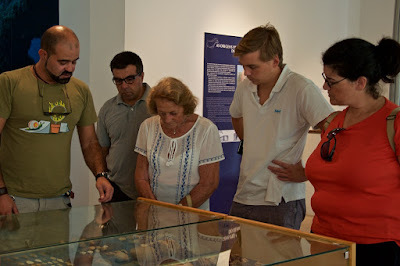 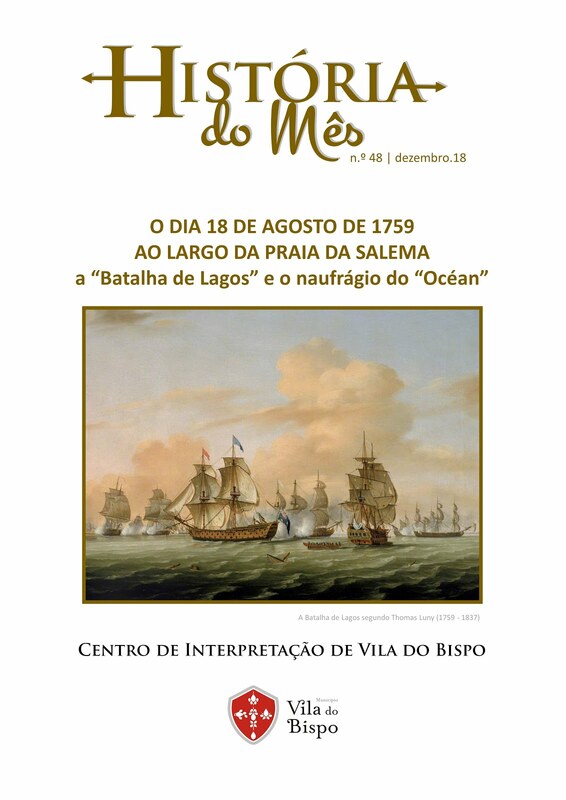 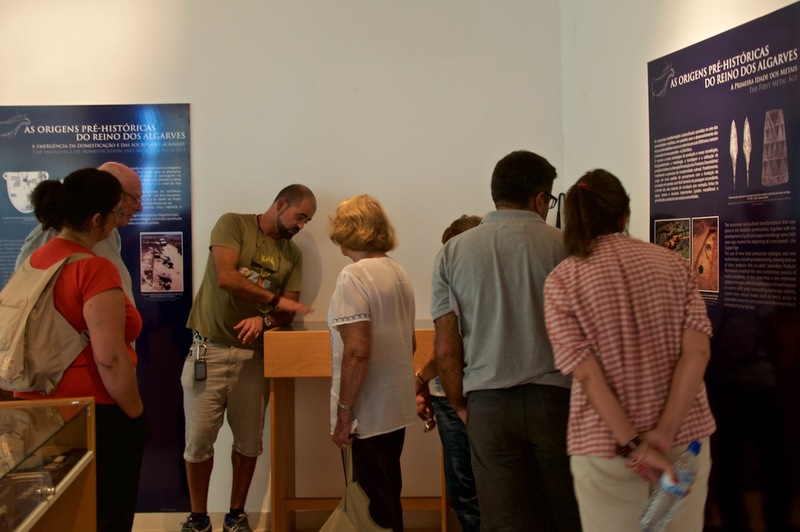 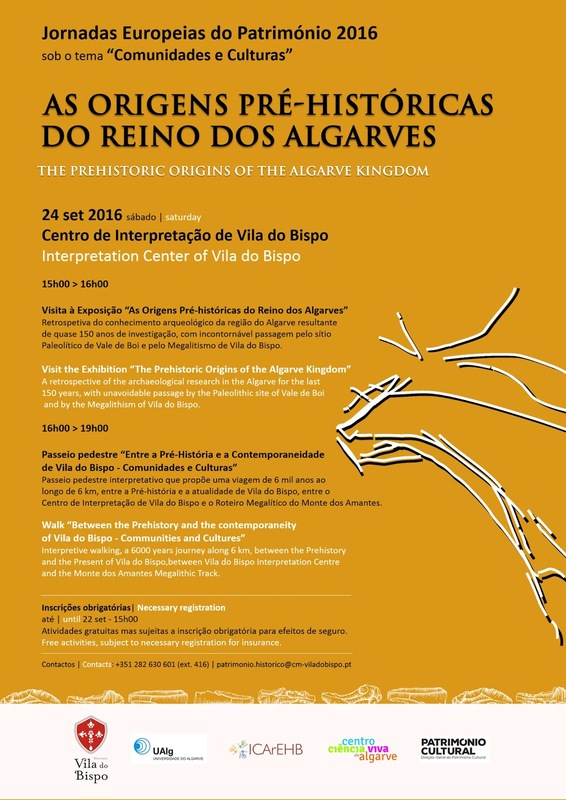 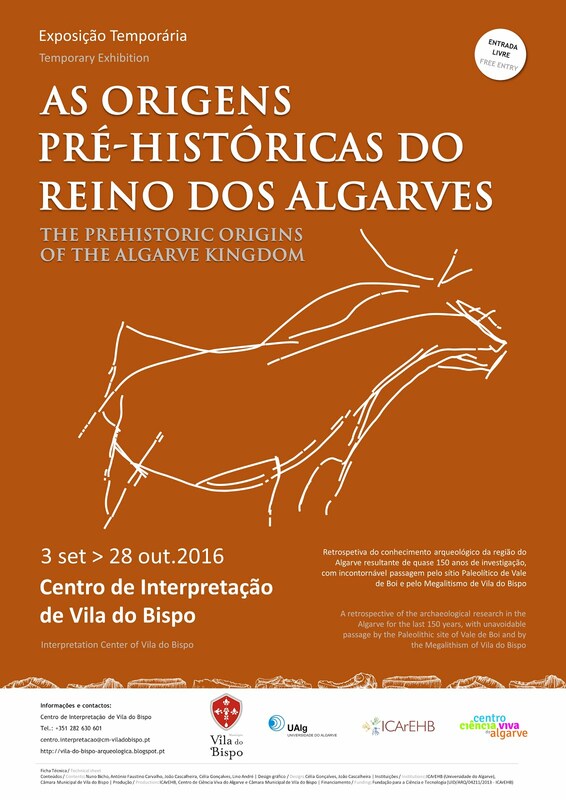 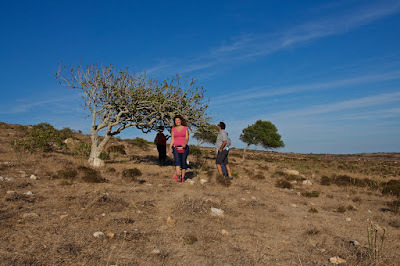 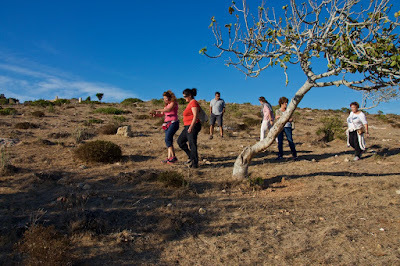 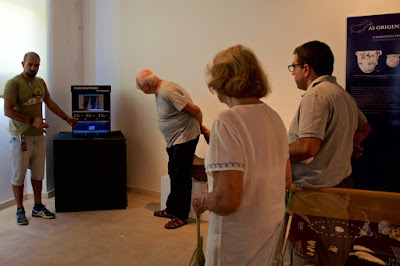 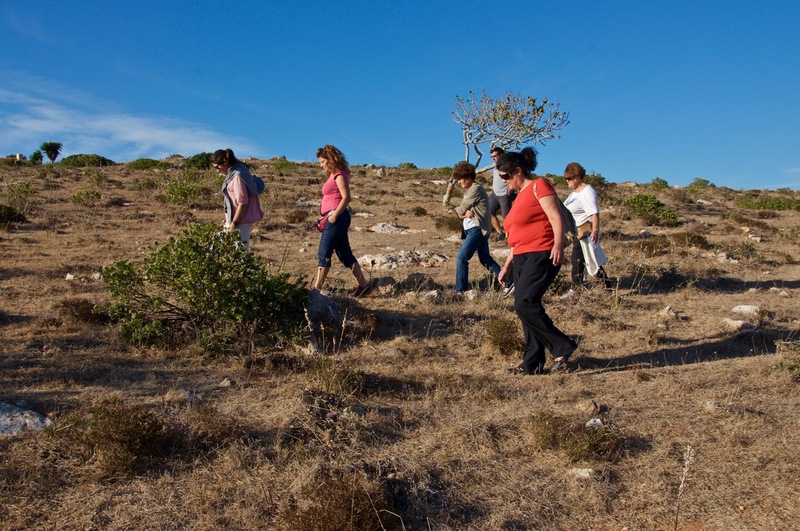 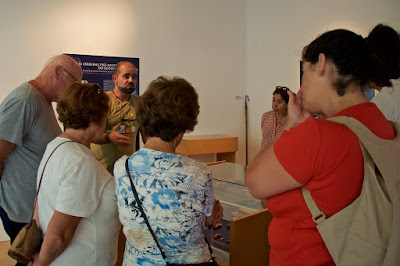 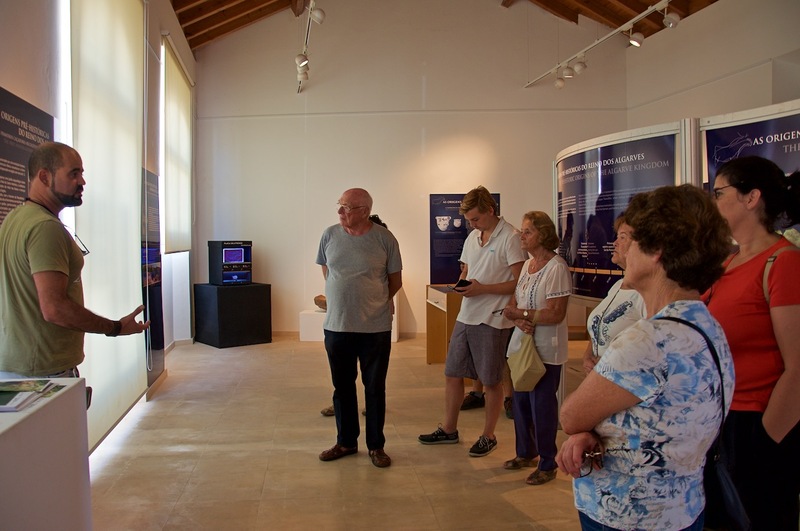 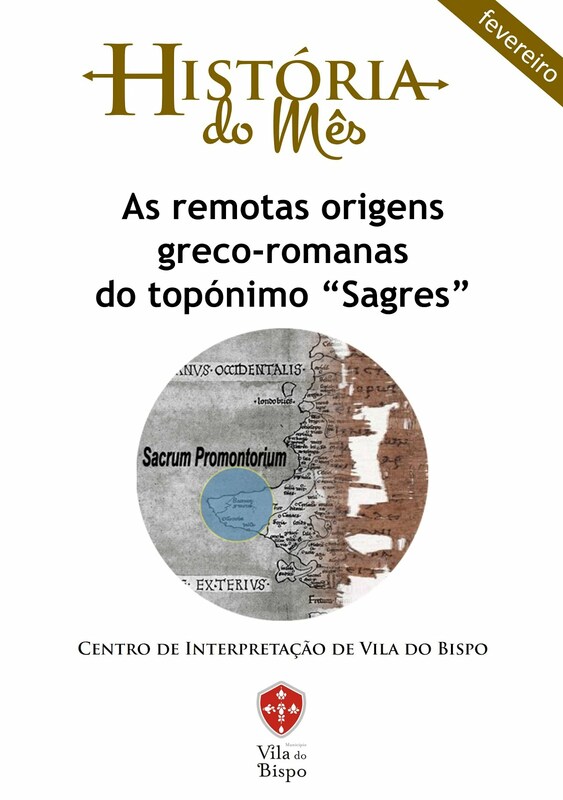 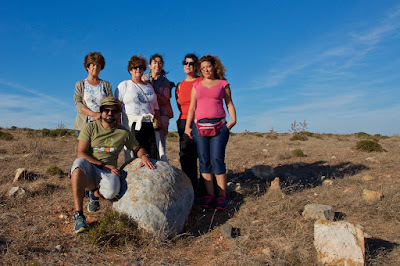 Pelas 15h00 o Centro de Interpretação guiou os participantes numa visita pela exposição “As Origens Pré-históricas do Reinodos Algarves”, uma retrospetiva do conhecimento arqueológico da região do Algarve resultante de quase 150 anos de investigação, com incontornável passagem pelo sítio Paleolítico de Vale de Boi e pelo Megalitismo de Vila do Bispo. 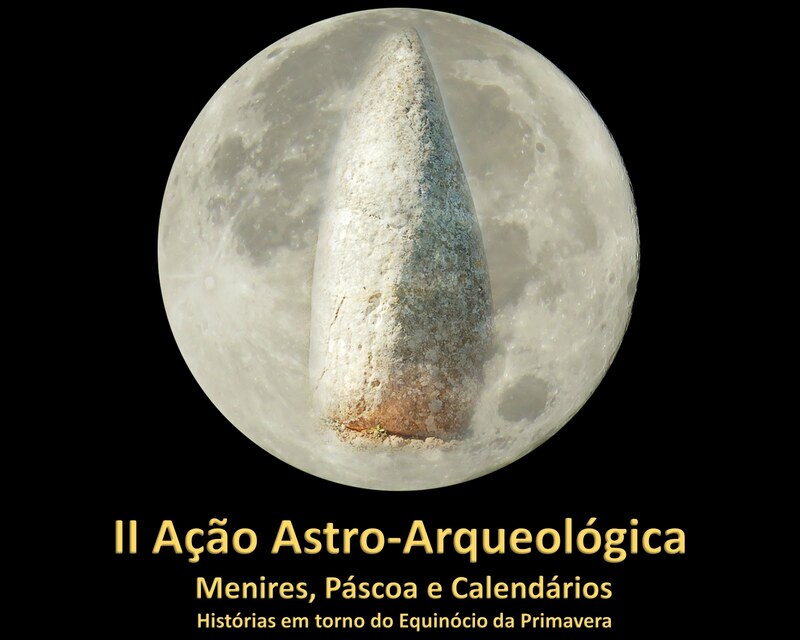 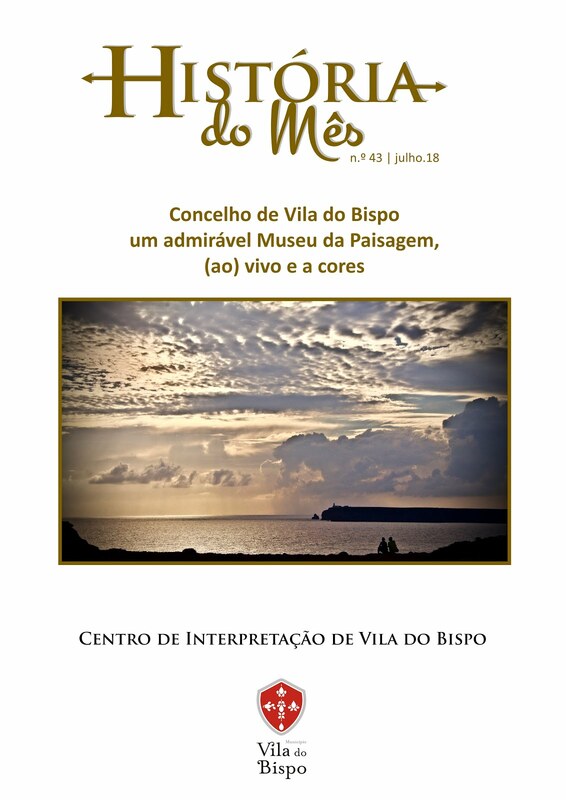 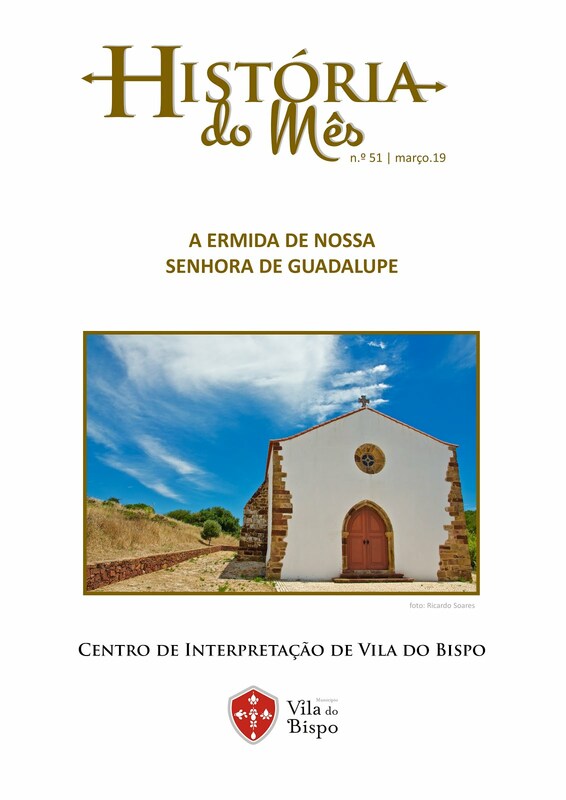 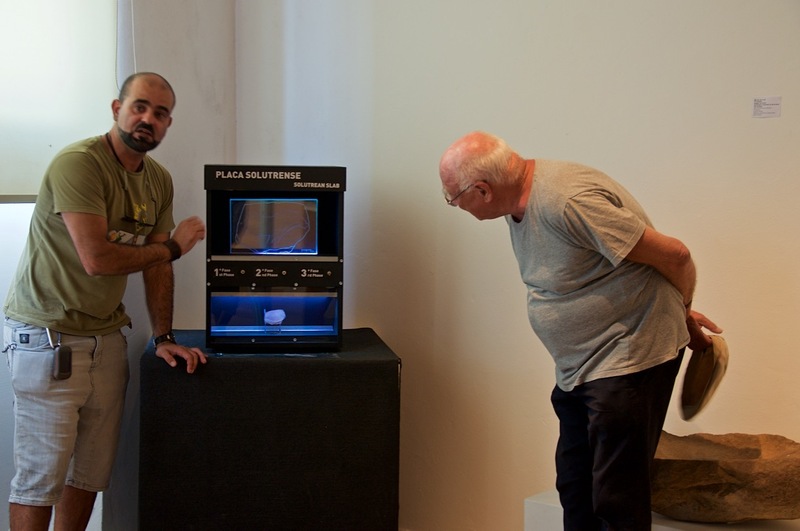 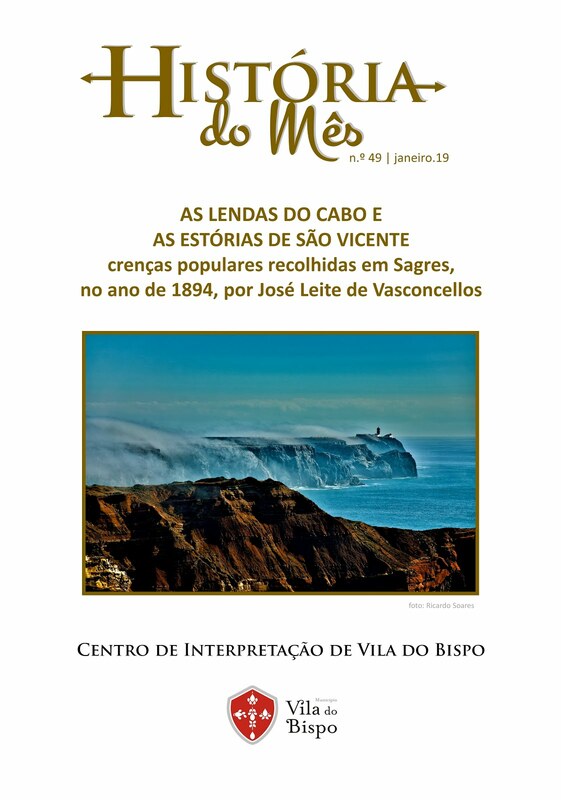 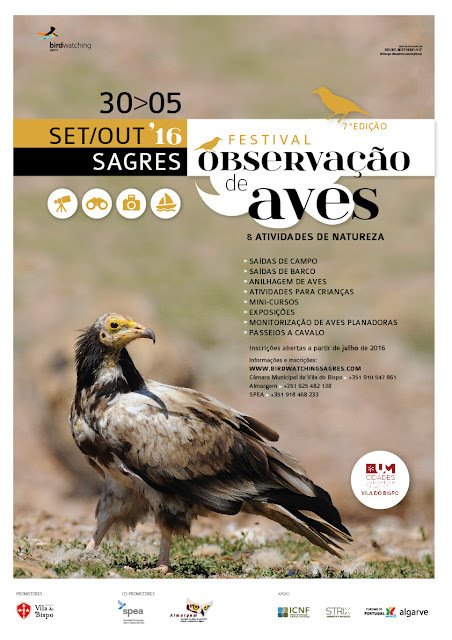 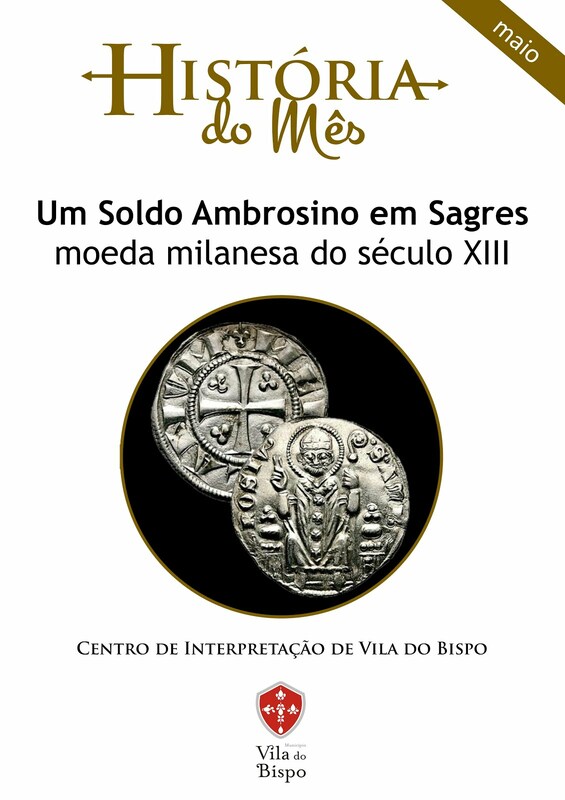 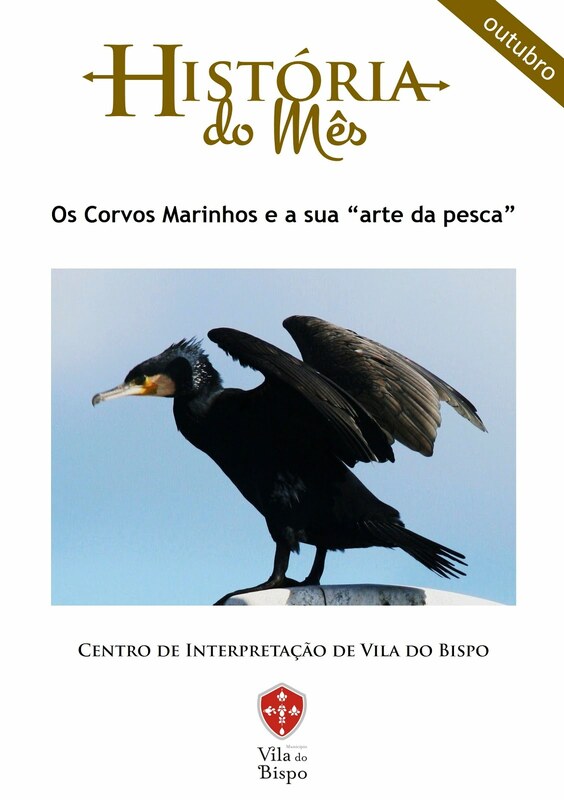 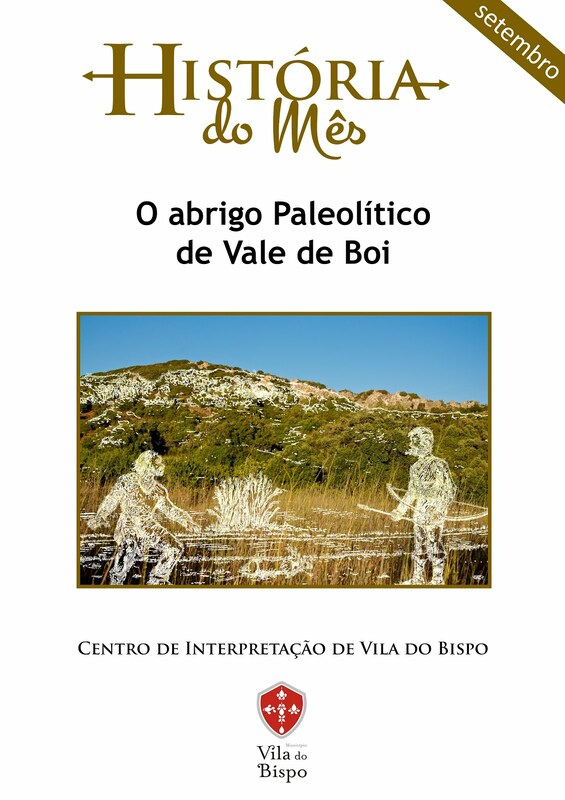 Recordamos que esta exposição foi produzida pela Universidade do Algarve, com o apoio do Centro de Ciência Viva do Algarve e da Câmara Municipal de Vila do Bispo, e encontra-se disponível ao publico no Centro de Interpretação de Vila do Bispo até ao dia 28 de outubro. 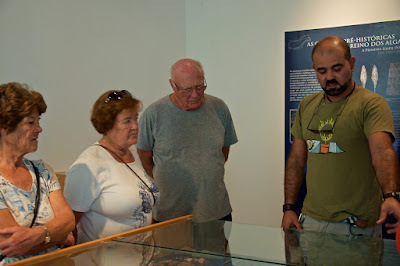 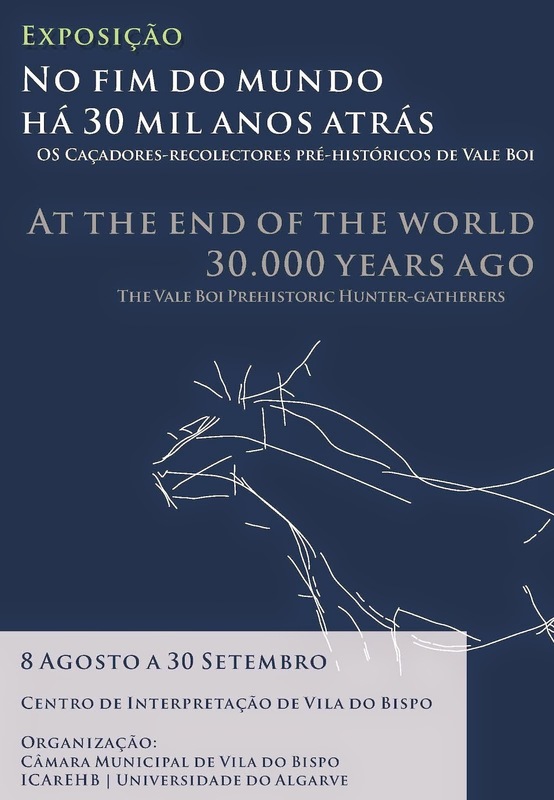 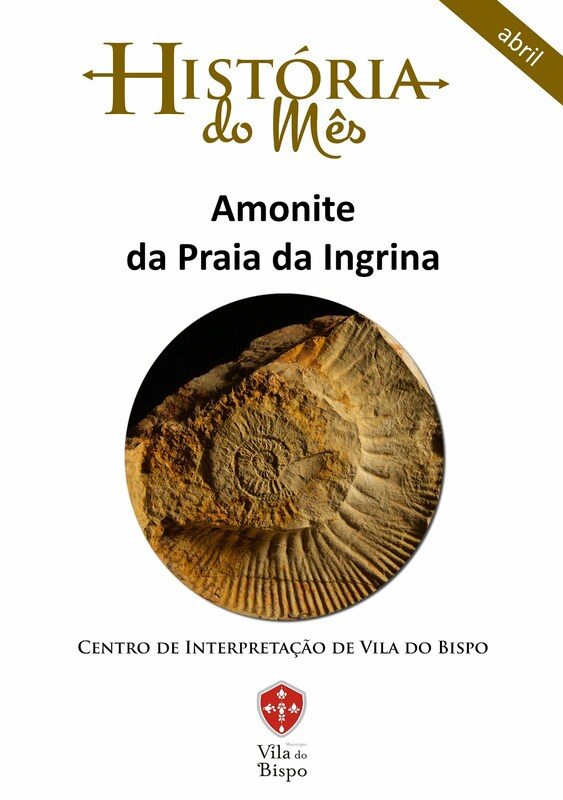 Depois da visita à exposição, alguns dos participantes embarcaram na aventura de um passeio pedestre “Entre a Pré-História e a Contemporaneidade de Vila do Bispo”, uma viagem interpretativa de 6 mil anos ao longo de 6 km, entre a Pré-história e a atualidade de Vila do Bispo, entre o Centro de Interpretação de Vila do Bispo e o Roteiro Megalítico do Monte dos Amantes.